This morning I decided to clean out my son Christopher’s backpack. He tends to be my less organized child, and his backpack is a mess. When I decide to clean out his backpack, I never know what to expect. The last time I found an old banana peal. I thought I was going to “LOSE” it, and had to wash his backpack in the washing machine. This morning I found a “blessing” amongst all the miscellaneous papers. I found a piece of artwork he created in school. 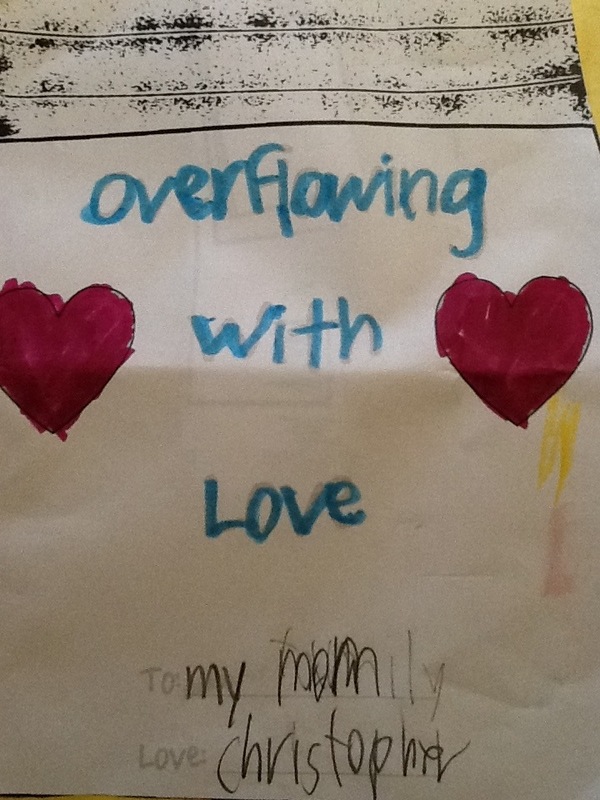 The title was “Overflowing With Love… To My Mom… Love Christopher”. It was a picture of a jar, glued onto a yellow piece of construction paper. Tucked inside the jar were small pieces of paper. Each one written something he loves about “me”, his mom. Not to brag or anything… But here’s what those little pieces of paper said. 1. I like it when you cuddle me. 3. I like your homemade Macaroni & Cheese. 4. Thank you for helping me to be brave when I was at the hospital. 5. You always make me happy when I’m sad. These are the moments I live for as a mom. Unfortunately, we moms don’t often get accolades from our children. Moments when they tell us of their love, and all that we mean to them, are few and far between. When the words come, I cherish them… soak them up… store them for gloomy days. Days when I question whether my children love me, whether I’m making a difference in their lives, and for days I need reminded of the importance of my job as a mother. Moms… Our job is of utmost importance! We are our little ones “tangible” comfort on Earth. They feel God’s love when we encourage them, love them, hug them, and care for their well being. Your children may not exhibit thankfulness. Rest assured… weary… over-worked… exhausted momma’s. You are making a difference! They love you… completely! They need you to walk with them through this thing called, “childhood”. Mothers, when you find a note… a card… or hear a word of kindness from their little hearts, take it to heart. Frame it… take a picture of it… write about it on your blog… these words of gratefulness are quite rare. Cherish them… and store them up for rainy days! Next Post Are You Running Out Of Gas? I know! I’m still thinking about how to write about the situation with Robby! Thanks for commenting!